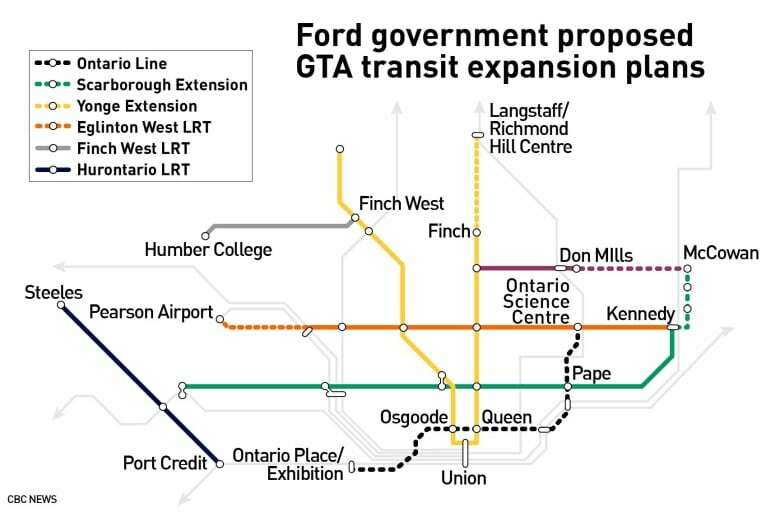 Premier Doug Ford's government on Wednesday unveiled its nearly $30-billion Toronto-area transit expansion plan — including a new 15-kilometre "Ontario Line" stretching from Ontario Place to the Ontario Science Centre in Toronto. Meant to replace the proposed downtown relief subway line to ease what Ford calls "dangerous congestion," the proposed, $11-billion "game changer" will be double the length of what the City of Toronto envisioned. "We are making the biggest and largest investment in new subways in Canadian history," Ford told reporters. Ford and Transportation Minister Jeff Yurek made the announcement at GO Transit's Willowbrook maintenance facility in the Toronto suburb of Etobicoke. No representatives from the city or federal governments were present at the news conference. With the province changing course on several projects already underway, critics have raised concerns about potential cost overruns, construction delays and wasting some of the $224 million of public money already spent on the planning and design of transit infrastructure in Toronto. "This isn't costing, this is a bunch of scribbles on a map," Liberal MP Adam Vaughan, who represents a downtown Toronto riding, told reporters on Parliament Hill. Meanwhile Toronto city Coun. Josh Matlow of Toronto-St. Paul's said the announcement amounted to "plans that don't make sense with money that doesn't exist yet." The Ontario Line, provincial officials say, will be a "free-standing artery" independent of the Toronto Transit Commission (TTC). "The TTC are great operators. They're just not experts in building," Yurek said. "We can do things the city can't. We can prioritize, make decisions, and perhaps most importantly, finance these projects." The proposed light rail line will run mostly underground with the potential for an elevated track along certain portions of the route, like crossing the Don River. The project is slated to be finished by 2029, or two years earlier, and will include the possibility of driverless trains. 'We are making the biggest and largest investment in new subways in Canadian history,' Ford, right, said Wednesday while revealing his government's transit plan for the GTA alongside Transportation Minister Jeff Yurek. Matlow called the proposal "a mixture of medicine and snake oil. "It doesn't fully make sense to extend it down to Ontario Place, I don't know why he's doing that … Why spend the money there instead of maybe an LRT on the waterfront?" And it's just one of the Ford government's four priority projects, along with extending the Yonge subway line north to Richmond Hill, expanding the Eglinton West LRT west, and building a three-stop Scarborough subway extension. You can read complete details of the plan here. 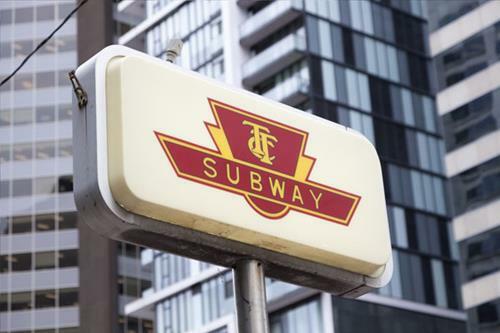 The province wants to own the lines but leave the city and TTC to operate the subway system. Yonge extension to Richmond Hill: $5.6 billion. Eglinton West extension: $4.7 billion. The province has committed to spending $11.2 billion — more than one-third of the total cost — on the projects. Speaking to reporters from city hall, Toronto Mayor John Tory said he was pleased the province has chosen to fund four projects that have already been endorsed by his executive committee. "This is a significant win for the city. [Ford] has accepted the fact that we have to work together," he said, adding that he considers today's announcement a series of proposals that can be further negotiated with the province. Tory said that the city "still has a long list of questions" that need to be addressed. "I did look at the map ... it didn't even put stations on it," he said, adding that he assumed they were left off "so that they could discuss those details with us." Tory also expressed concern that the province's proposals will further delay projects that have already been approved, like the Scarborough subway extension. Even with provincial funding, the federal government and the city will be expected to make up the remaining $17 billion for the projects. It's not clear how much Ottawa may be willing to commit or how Toronto will come up with its portion of the costs. The federal Public Transit Infrastructure Fund is on track to spend about $2 billion on Toronto transit projects over the next decade. That money is distributed to municipalities based on ridership numbers. Ford did say, however, that his government has allocated future funding based on an assumption that Ottawa will cover up to 40 per cent of the costs of new builds. If they don't, Ford vowed his government would "backstop it ourselves." Following the announcement, federal Finance Minister Bill Morneau questioned why provincial officials were alone at the announcement. "Our obvious question is why the Ontario government is out talking about investments in Toronto without the mayor of Toronto," he told reporters on Parliament Hill, adding that Ford's government hasn't been at the table with Ottawa. For years, a battle has been simmering over how best to expand Toronto's subway network. The Ford government wants to extend the Yonge subway line to Richmond Hill on an earlier timeframe than the city prefers; add two stops to the existing plans for the Scarborough subway; and bury the Eglinton West LRT extension through Etobicoke, a decision that would more than double the cost of that project. Metrolinx, the provincial transit agency, has said it's paramount that the Downtown Relief Line open before the Yonge line is extended north into York Region. Under the province's plan, the Ontario Line won't stray from this timeline. The Yonge line operates at or above capacity every weekday, according to the TTC. Metrolinx has predicted ridership would exceed peak capacity of 28,000 people per hour by 2041. The Scarborough subway extension is among the projects ready to enter the construction phase by the end of 2020, according to a report released last week.